I wonder if one cat is trying to annoy the other by copying??? You know it! Neither one will give up their spot. Cute! Looks like a perfect place to take a nap! happy WW! LOL even the dogs are giving each other a knowing look. Have a wonderful Wednesday. That looks like a very comfortable place to rest! The videos I see underneath your sleeping place made me giggle too. Look, you have Spaceballs!!! And Se7en, whoa, that one was creepy but it did end with a huge shocking bang. You have the LOTR (books or video) and you even are in possession of Rob Schneider's The Animal! I thought I was the only one but noooo. You're a complete nerd just like I am!!!! So cute! My pets seem to do that a lot too. It can't be a coincidence, can it? OK so just because Mum loves Gingers * ahem * WooHoo nice one guys - love the sleeping synchro!!! Love it! 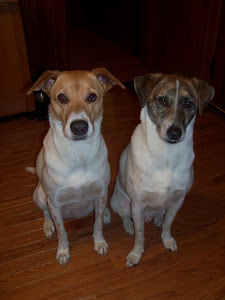 I am working on a post I call "Twins" where my cats (or dogs) wind up mirroring each others' poses or positions. Typical cats, being smart and showing off to the dogs!